You want maximum frame rates at detailed airports? You want to avoid blurry terrain and have sharpness while flying? You want the best balance between performance and image quality? You don't want to change your settings while making a flight? You can turn down your detail settings because of that detailed airport which is bringing down your frame rates. You can use less autogen and lower the terrain settings when flying in order to avoid blurry terrain. Experienced simmers know that they can use different FFTF (FIBRE FRAME TIME FRACTION) values for maximum frame rates or avoiding blurries. FFTF actually determines the maximum amount of time per frame that will run fibre jobs on the primary thread. Your simulator's performance is greatly affected by the amount of time the CPU spends between foreground operations and background data scenery loading. The lower the frame rate is set, the more CPU time is devoted to loading scenery and textures. FIBRE FRAME TIME FRACTION is a direct command that helps tune the amount of time per frame that the CPU runs fibre jobs. Its default value is 0.33, meaning that the CPU will spend 1 millisecond on scenery loading in every 3 milliseconds of rendering. So, the lower the value, the better the frame rate, but there is also an increase in the blurries. But what if FIBRE FRAME TIME FRACTION is not static but dynamic? This can solve all the problems mentioned above! 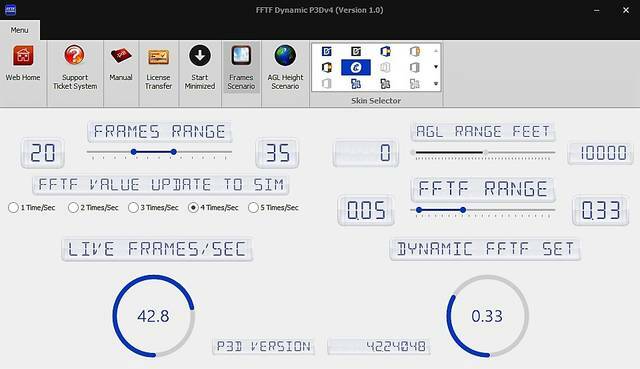 There are two options for dynamic FFTF calculation - frames range and AGL height range. 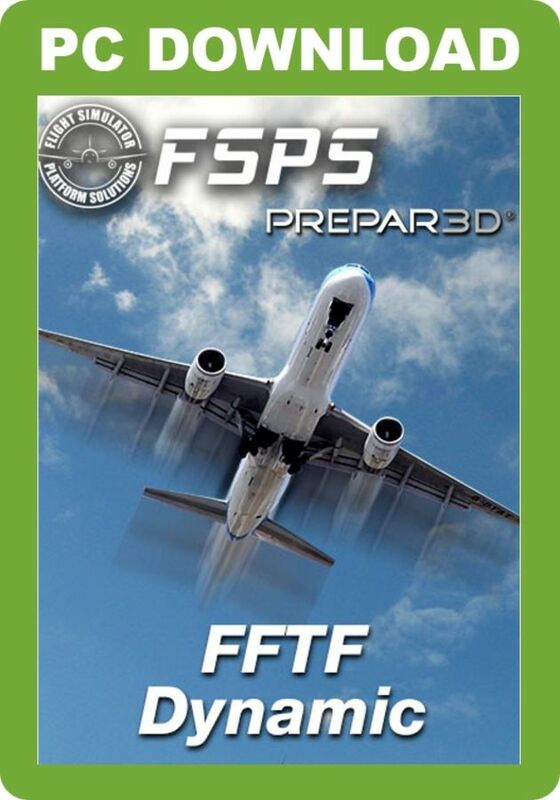 You set the minimum and the maximum frames + FFTF range + times you want FFTF to be updated per second to P3D. For example: Min frames=24, Max Frames=28, FFTF minimum=0.05, FFTF maximum=0.33, times to update per second=1. In this case at 24 frames FFTF will be 0.05, at 26 frames FFTF will be around 0.19 and at 28 frames FFTF will be 0.33. Below the minimum frames set, FFTF will always be 0.05 while above the maximum frames set, FFTF will always be 0.33. Suggested for the other options. You set the minimum and maximum AGL altitude + FFTF range. (Times to update per second is not available for AGL height option). For example: AGL Min=0 feet, AGL Max=5000 feet, FFTF minimum=0.05, FFTF maximum=0.33. In this case at 0 feet FFTF will be 0.05, at 2,500 feet FFTF will be 0.19 and at 5,000 feet, FFTF will be 0.33. Above 5,000 feet FFTF will always be 0.33. Every time that the application calculates the new FFTF, it immediately updates the new FFTF value to P3D. This is the main reason that we do not need any timer option in this case. This utility gets the fibre frame time fraction values in P3D to provide the best balance between optimum frame rates and graphic quality. The application is dynamic rather than static and covers every aspect of user configuration.